Don’t go falling all over yourselves, because it’s time for this week’s Doomino Effect. Actually that’s a lie, because normally Tuesday is time for the Doomino Effect. But Fin Fang Doom didn’t buy enough comics last week to justify his weekly “Meaningless Awards” and Jean-Claude Van Doom hasn’t swung by yet with his “Worst to First,” and Doom DeLuise’s last words to me today were “post a new blog,” so here we go. Now let it be said, you may have thought to yoursef that I tend to only give somewhat favorable reviews. 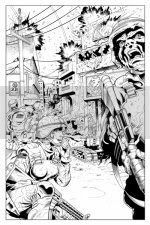 While I have known to dislike comics now and then, I do what is rather unique and groundbreaking in the world of comic blogs, and that is I buy comics that I like. So the odds of having anything resembling a 50/50 split on good and bad are unlikely, and quite possibly devastating to my comics habit. I’m going to try something different this week. Usually I carefully arrange the order of these books so that I might seamlessly segue from one to another, hence the implied domino effect. This week, I’m going to push myself to the limit and just go in the order that they’re currently stacked and just make the magic happen. 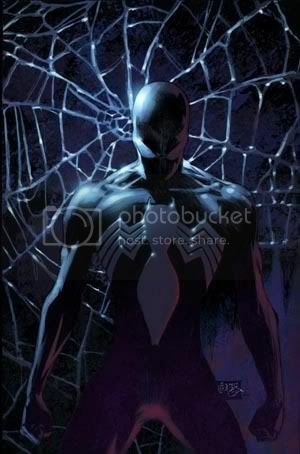 First up is Amazing Spider-Man #539. I don’t normally read ASM, but I picked it up last issue because it was supposed to be a big deal and I wanted to read the big deal as it happened. Well, I thought it was a stapled pile of crap folded in half. This issue at least was a big improvement on that. So now it’s a stapled mediocre blah folded in half. It’s really unfortunate that Kingpin is the bad guy, since that means Daredevil apparently takes place in the future. Too bad there couldn’t have been more communication there. But to me, this issue reads like a comics from the 70s or the 80s where the people don’t have real emotions or take real actions – they have COMIC BOOK emotions and take COMIC BOOK actions. I’ll do my best to illustrate what is essentially a gut reaction, but Kingpin is such a “bwahahaha” villain in this, quoting Euripides and just talking like a caricature of a villain rather than the cocky stud he is. Sure Peter might be losing Aunt May, and yeah, people are going to react to that very harshly, but he goes immediately to the vengeance stage with lines like “I don’t knock – I’m not in the mood,” which just seem like they should be in Lone Wolf McQuade and not a 2007 comic book. Well, at least now he’s in a black costume, so marketing is probably happy. Ron Garney’s art is solid, but I can’t help but wonder if that’s contributing to my instinctive reaction that I accidentally picked up an issue of ASM from the 70s. Personality Quiz: Which Comic Book Company Figurehead are You? A) Apologize and express an effort to meet release dates in the future. B) Blame the artist and say you have no control over when books get released. Click below to determine which comic book company figurehead you are. The latest book to be featured in our global war on people who don’t know enough about comic books produced outside the United States is The Professor’s Daughter, a decidely quirkly story of love between a mummy and a daughter of an Egyptologist (and can I just diverge from anything relevant here to say that there simply is no job title cooler than “Egyptologist”). The creators are Joann Sfar and Emmanuel Guibert of France, who gained more fame with their later children’s books Sardine in Outer Space (reviews of that coming soon). 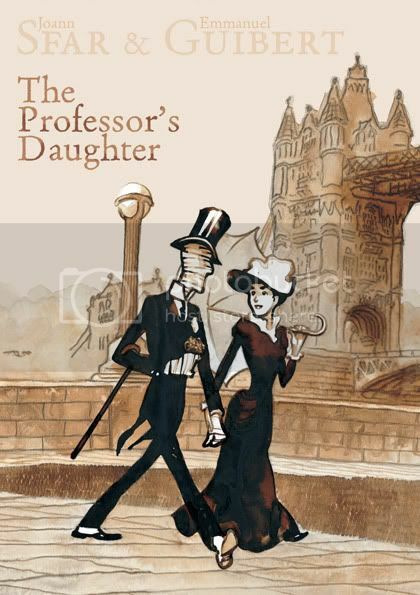 The Professor’s Daughter is a much more adult-oriented book, but it continues with publisher First Second’s theme of printing books that are shining examples of what all-ages books should be, mixing humor and excitement for everyone while not making dramatic concessions to coddle youngsters. It also boasts one of those classic premises that guarantees a solid work: A mummy has come alive (no explanation needed or given) and is traipsing across London with the daughter of the Egyptologist who located him. They come to be quite close when an unfortunate (and grim) turn of events starts them hurtling along in an adventure that seems somewhere between Jules Verne and Shakespeare (speaking to the tone, not literary quality). This week, Black Adam arrives at Oolong Island, the desert island that’s home to the team of mad scientists who are responsible for unleashing the Four Horsemen on the Black Marvel Family, which resulted in the deaths of Isis and Osiris. They don’t exactly throw out the red carpet and send over the Welcome Wagon, though, and it’s a brawl for all, as they take Black Adam to the mat. Elsewhere, Lex Luthor attempts to send that shape-shifter guy Hannibal to jail in his stead, but mild-mannered reporter Clark Kent realizes the plot and alerts Steel, who bashes down the lead door the real Luthor’s hiding behind, and it’s off to jail for that poor schmuck. Not sure why they included this bit. The main chunk of the action takes place on Oolong Island, naturally, as the mad scientists really do take a stand and beat the piss out of Black Adam. Professor Morrow also wins his online auction for the Red Tornado’s head, which was put into part of an art sculpture awhile back. After putting Black Adam on the floor, Doctor Sivana instructs some toughs to take him to Sivana’s laboratory for some extra fun torture. This week closes with the JSA (what’s left, anyway) assessing the damage in Bialya, which Adam destroyed last week. The assessment? Two million dead. No survivors. Atom Smasher shows up on the scene and requests to be put back on the JSA roster to help take down Black Adam. 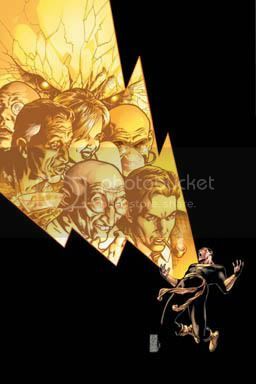 Man, everybody wants to take down Black Adam. I’m guessing that once he breaks free of whatever torture the mad scientists want to put him through, he’s going to be awfully angry. Maybe even start a war. A world war, perhaps. Nah, they wouldn’t do that. That would be boring. I guess we’ll see in, oh, four weeks or so. Next week’s preview shows Natasha Irons in her new steel costume, Animal Man flying fast, Nightwing perched on a broken window-sill ala Rorschach in the first few pages of Watchmen, and Montoya looking at something. I guess that means we’ll be heading back to Gotham to give Black Adam a few weeks to rest up. Sometimes a comic book company will announce a bit of news and I’m just not quite sure what to make of it. When that happens, I’ll weigh the pros and cons of the issue in a new feature called Good Idea, Bad Idea. 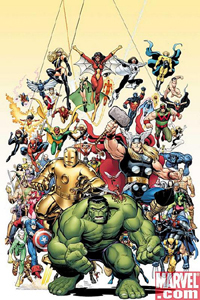 Last Friday, Marvel announced the start ofa new series dedicated to the good old days of the Earth’s Mightiest Heroes: Avengers Classic. It will be a reprint series in the vain of X-Men Classics, where a classic story is reprinted, followed by a back-up tale set in the same period as the main story. Good Idea: Creating a new series that caters to Avengers fans that aren’t crazy about the All-New, All-Mighty adventures currently being published. I’m not a fan of Brian Michael Bendis’ writing. Unfortunately, I am a big fan of the Avengers. Right now, those two things just don’t mesh. Bendis has a stranglehold on the franchise (of course, it wouldn’t even be a franchise without Bendis’ star power). I can’t have the Avengers without Bendis, but I don’t want the Avengers with Bendis. Marvel was able to remedy that for a while with Young Avengers, Earth’s Mightiest Heroes and New Thunderbolts, but YA is done, EMH is nearing the end of it’s second all-too-short run, and T-Bolts is radically different from what it was two years ago. So where can I turn when I want a good old-fashioned Avengers fix? Just my long boxes…and Marvel doesn’t make any money from that. Bad Idea: Starting at the beginning. Don’t get me wrong, the early issues of Avengers were great. It’s Stan Lee and Jack Kirby, so how can you go wrong, right? But the Avengers back then hadn’t yet developed into what comes to mind when I think of the Avengers. I’m talking the Kree/Skrull War, Under Siege, the Korvac Saga…the real “classic” Avengers storylines. That’s what I want to read when I’m in the mood for classic Avengers. And unfortunately, a lot of stuff from that time period isn’t collected in trade form. But the early years? We’ve got the Essential trades for that. 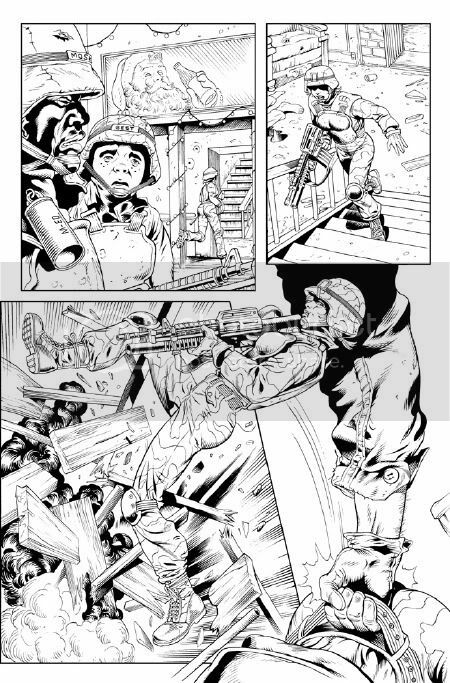 And if you don’t like black & white, you can get full color in the Masterworks series. Both of those collections start from Avengers #1. Do we really need a third series of reprints starting from the first issue when there’s so much great stuff that’s never been reprinted? 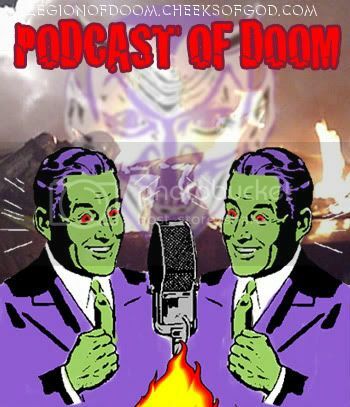 JIM DOOM: Hello and welcome to the first ever Podcast of Doom. I am your co-host, Jim Doom. DOOM DELUISE: And I’m your other co-host, Doom DeLuise. Glad to be here. You look nice. Is that a new shirt? DD: Oh, my bad. Nice tattoo. JD: Nevermind that. We have plenty to talk about today, including World War Hulk, World War Three, and to get us started, have you been reading Justice League of America? JD: Well when I was reading Mighty Avengers #1, it made me think about the first 6 issues of Justice League, and how those two books’ way of introducing a new lineup could not have been more different. One book takes a single issue to introduce the team, the other takes so blasted long you forget there’s an actual story going on. And so much story happens that the simultaneous drama of who makes the team is completely lost. I realize that Brad Meltzer is going for a different feel, but that first JLA arc just seemed so indulgent that for me, it lost virtually all impact. DD: Well, I didn’t much care for Might Avengers. Yeah, they set up a new team real quick-like in one issue, but it just seemed somewhat boring to me, since the eventual team that was put together is pretty, well, boring. Don’t get me wrong, I like Wonder Man, but the rest of the guys are just lame. And I still haven’t come around to liking Iron Man after his actions in Civil War. Meanwhile, I think that JLA has been an incredibly fun read. I especially like how, in the last issue of the arc, they show the team dynamics of how they fight together. Granted, this may have been done even better in that issue of Green Lantern a couple months back, but it gave me the feeling that these guys are the A-Listers, and together, you’d be hard pressed to find a villain in the world who could take them down. 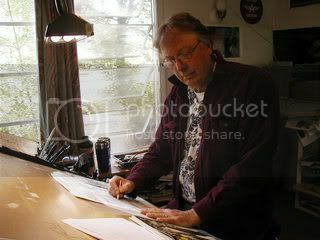 JD: I do think that Brad Meltzer has a really good handle on how to use characters’ unique aspects and write with those as a tool rather than just something that has to be acknowledged, and I especially got that sense in the past few issues. It was just moving so slowly I just had to look back to previous issues to remind myself what was going on. DD: I think that had a lot to do with the fact that it was so heavily delayed. JD: And I don’t like anybody in the Mighty Avengers, and I dislike some of them. But I’m intrigued by how they’re going to build these guys into an A-list team. And I also like how the Sentry’s super-power was addressed. Speaking of not liking Tony Stark, did you read Civil War: The Confession? DD: Nope. I read the preview on the Internets and was so bored by those three or four pages that I didn’t feel like dropping the money. Did Iron Man confess he’s gay? Jean-Claude Van Doom: First, how did this project start developing? From the first issue, it seems like the kind of story that could almost spark from just a quick thought, or a piece of a news report. Rick Veitch: Like just about everything I’ve done, I’m coming at ARMY@LOVE from a couple different directions. The obvious one is the socio-political situation we find ourselves struggling with these days. That’s something you’ll see that in the plot set-up of this series, which satirically imagines what the current war will look like five years in the future. Along with that there is the human dimension; the psycho-sexual-spiritual qualities of modern life that the characters hopefully come to embody. For me, character creation and development is an intuitive process, and I’m happy to report the extensive ARMY@LOVE ensemble has come alive in my head and are dictating their dialogue and parts. The third foundational element is the form itself. 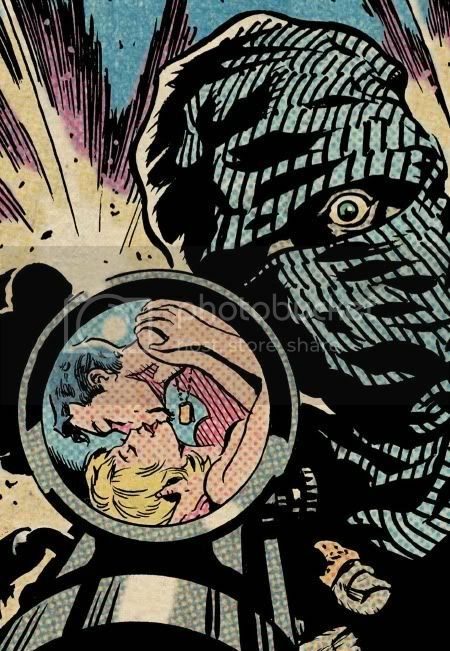 Like the title suggests, ARMY@LOVE mashes up two comic-book genres, the war comic and the love comic. What I find interesting about these two genres is how they both still embody a sort of simple, Roy Lichtenstein approach to panel art. I mean, Sgt. Rock only exists on the battlefield; he never agonizes over breaking up with his girlfriend. While love comics traditionally avoided any kind of meaningful social commentary. I’m trying to expand and explode them both in ARMY@LOVE. JCVD: I don’t know if I interpreted the first issue right, or if the message of the series changes as it goes along, but what struck me was that you didn’t seem to make any direct moral statements about the wars in Iraq and Afghanistan. Maybe a better way to put it was that the story seemed to focus on the individual morality of the soldiers, rather than the war in general. What do you see as the message of the book? RV: The characters always have to be out in front, with the “message” (if that’s what we must call it) serving as a motivational and defining backdrop. In this case, I’m looking at the situation we’ve got ourselves into in Iraq and imagining what comes next. Everyone seems to be thinking we are going to pull out in a year or two, but as sad as I am to say it, I don’t believe that is going to be the case. I suspect we are in for a decades-long conflict all across the middle east and southern Asia. ARMY@LOVE imagines how the powers that be might have to rebrand such an unpopular war, in much the same way consumer products are routinely rebranded, to keep it going. The second issue explains this in a lot more depth, introducing the idea of the “corporate draft”, while the whole satirical approach to marketing and funding war expands over the length and breadth of the series. After a week hiatus (nothing worth fightin’ over came out), we’re back this week with our communal review of Aquaman #50, in which famed fantasy author Tad Williams takes over writing chores from Kurt Busiek. I think I speak for us all when I say Busiek will definitely be missed. Post-Crisis he took the book in a very new, unexplained direction and renovated a stale character into a fantasy oriented undersea adventure. Think Conan: The Frothy Tales. Williams has written a ton of fantasy material, so he seems like a great fit to take over from Busiek. As always, come back Saturday to see our thoughts and share your own. Acclaimed fantasy novelist Tad Williams (THE NEXT, The Dragonbone Chair) begins his stint as the new chronicler of the adventures of the young man who would be King of the Sea! Joined by the new art team of Shawn McManus (THE SANDMAN, SHADOWPACT) and Walden Wong (THE CREEPER, THE NEXT), a new horizon beckons for Aquaman, as new challenges await and new characters from this undersea world are introduced. It all begins here, in this extra-sized 50th issue extravaganza!